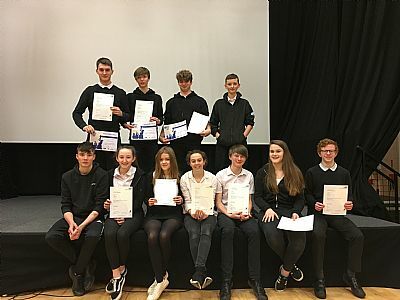 We are proud to share how many of our pupils here are involved in the Highland Young Musicians group. This amazing group of young people took part in the Concert on Saturday 30th March. A big well done to them and a big thanks to their families for all the support they offer with this. 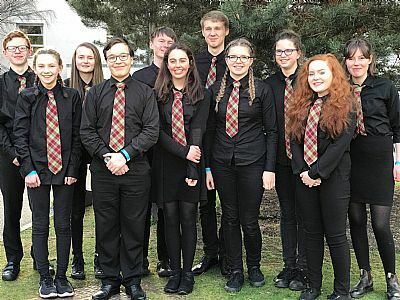 Highland Youth Choir - Alistair Tait, Ian Kammerath, Ishbel Macintyre, Bella Sutherland, Rachel Bolton, Janie and Sally Patterson. Highland Youth Strong Orchestra - Dugald Macintyre and Mitchell Macpherson. Highland Youth Wind Band - Bethan White and in the Highland Regional Youth Orchestra - Rachel White. 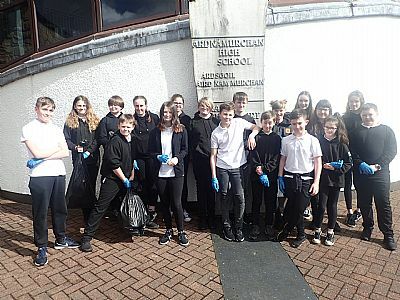 Contributing to the annual community clear up, this picture shows our S2 Team taking part in our second litter pick up of the month. The S1s already took advantage of a dry day last week and collected a few black bags! Thanks to them for the effort and commitment. 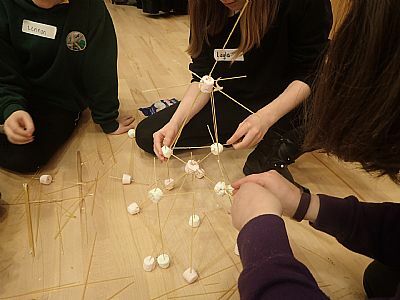 Our penisula P7 group joined us for their first transition day on Tuesday 26th March. The day was mostly about team building and included some fun activities. The pupils seemed to enjoy their day and we hope they are looking forward to our next transition day on 4th June. 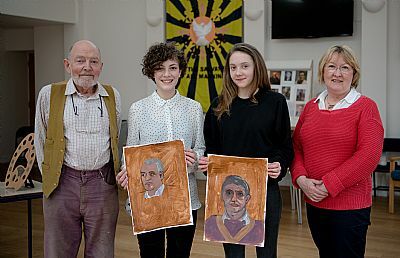 This year's final of the Youth Philanthropy Initiative was held on on Wednesday 27th March. All 5 teams made their final presentation in front of a panel of judges and representatives from the various charities chosen by the teams. Judges comments were favourable for all teams. The team with the presentation judged as best matching the strict criteria was representing Lochaber Women's Aid who received the cheque for £3,000. Well done to all participants and all charities involved who gave up their time to the team members.Thank you also to VAL lead, Margaret Boyd for her organisation of the event. A big well done to everyone who contributed to our Red Nose Day fundraising. A total of £300.35 was raised. Big thank you to our S6 team of Kay Christian and Eden Gordon for organising the day and selling so many noses! The Highland Council Catering Service are piloting a new way of making online payments for school meals. 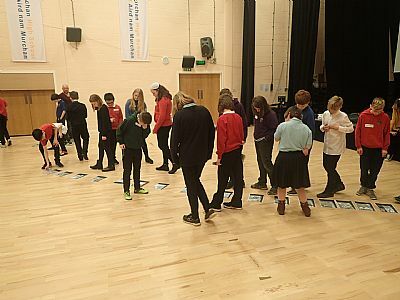 The new system is called iPayimpact, and has been piloted in Balloch Primary, Milton of Leys Primary and Culloden Academy. Look out for the Letter and FAQ sheet (which will be with you week beginning 18th March) containing information and step by step instructions on how to use the new payment system. Note you will not be able to make internet payments between the dates of 22nd March and 31st March whilst work takes place on disabling the old system and activating the new system. During that period payment for school meals can be made using the Reval Machine in Ardnamurchan High. For more information on how to take part in upcoming sessions, please visit SCHOLAR's Online Tutor Sessions. This is a reminder to all our parents and partners that you are welcome to join us in Ardnamurchan High School tonight for our annual Partnership Evening. This will be an informal event with drinks and nibbles prepared by our pupils to enjoy and a short presentation celebrating our partnerships. On Friday 8th March, a group of our Scottish Studies students took part in a curriculum trip. A tour of the interior of the Kelpies and a viewing of the Falkirk Wheel made it an interesting and enjoyable day. Are you aged between 16 – 19? If you can answer yes to all of these questions, this may be the perfect job for you! Exciting opportunities have arisen to work as Mechanical and Saw Doctor Apprentices within BSW Timber at Fort William. The company is looking for individuals with a strong passion to learn and gain a career within the timber industry. We will help you learn and develop on the job and through study - gaining a recognised industry qualification at the end of your training. No experience is necessary as full training is given. Applicants MUST hold National Level 4 in English, Maths and a science based subject. 15 of our girls travelled to Ballachulish yesterday to take part in the annual Donella Crawford Cup event. The girls did the school proud in a very competitive competition that drew 17 teams from all over Scotland. Portree A won the cup for a second year in a row. Hopefully we will have the competition held back at AHS next year. The Calmac Apprenticeship Schemes are now live! The company are looking for 20 Modern Apprentices for their Deck, Engine and Retail programmes. The Association is looking to recruit an enthusiastic individual to complete a fixed term 2 year housing management modern apprentice programme. This is an exciting opportunity, for a bright, motivated individual, who is interested in a career in housing. You must have good I.T and communications skills and enjoy working with the public. To attain the Modern Apprentice in Housing, it is essential that you hold a Business Administration qualification, or have experience of working in an office. Completed applications should be submitted by Noon on Friday 22nd March 2019. Well done to all our teams who took part yesterday. 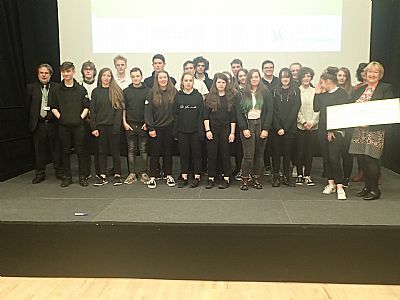 Although we gained a 4th, 3 thirds and a second it has to be remembered that these are the finals for the whole Highland Region and we have done really well to qualify. The Senior boys came up against very strong opposition in the Glen Urquhart team and gained a commendable result. The Senior girls went out of the final on penalties having played two tough games. 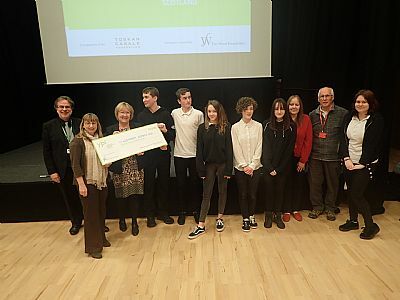 On Wednesday 27th February, as part of our Sexual Health and Relationship Education programme, senior pupils were involved in a session by Wavelength, a third sector organisation. On Tuesday 26th February, AHS welcomed Paul Beaumont from the Scottish Science Education Resource Centre, Dunfermline. He gave an entertaining and informative talk to our Senior Phase Science Pupils on Biology, Chemistry and Luminescence in Physics. SSE apprentice and trainee roles are now live! SSE are coming to some of our school Scottish Apprenticeship Week events so this will be a good opportunity for pupils to speak to them and find out more then. Please see below for details of an opportunity to work with the BBC. Pupils 18 and over can apply for their Digital Journalism Apprenticeship. Applicants will be based in either Glasgow, Inverness, Aberdeen, London or Salford with the opportunity to earn £21,000 and work alongside professionals to gain skills and experience. The closing date for applications is the 7th February! This looks like a fantastic opportunity for any young people interested in pursuing a career in film/ television as Outlander are offering traineeships in hair and make up, props, script supervisor and many more areas for their season five series. This opportunity would allow job candidates to work on one of Scotland's biggest TV productions and applications are now open. We are pleased to share photos of our Sports' Leaders who attended a 'Make it Happen' event recently.